Does your cleaning company meet the ServiceMaster Standard? Are you confident about who has access to your building? Yes! ?? Are you sure they are using non-toxic and environmentally friendly chemicals? Yes! ?? Are the cleaning personnel highly trained and well-supervised professionals? Yes! ?? Are you familiar with their cleaning routine and task schedule? Yes! ?? Is there a clear system of communication in place? Yes! ?? 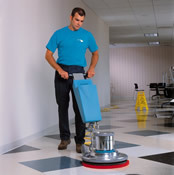 Are they willing to customize janitorial services to meet your needs and your budget? Yes! ?? Quality, professional janitorial cleaning services are important for two reasons. First, a well-maintained office building speaks well for the company and presents a professional atmosphere to potential clients. Second, a cleaner office space means healthier, more productive employees. You want your facility clean and secure at an affordable price. At ServiceMaster® Building Services we strive to combine excellent customer service with proven cleaning systems to provide a janitorial program specifically tailored to your needs.